The Indian Premier League 2019 or IPL 2019 schedule is out. The season 12 of IPL begins from March 23 as was announced earlier by the Board of Control for Cricket in India (BCCI). However, the cricket board had released the fixture for just first two weeks as it awaited the Lok Sabha election 2019 dates, which were announced last week. BCCI has now announced the full schedule of IPL 2019 upto league stage. The board is likely to announce playoff dates separately. We bring you PDF of the IPL 2019 schedule with fixtures, matches, teams and venue details which you can save it for free. 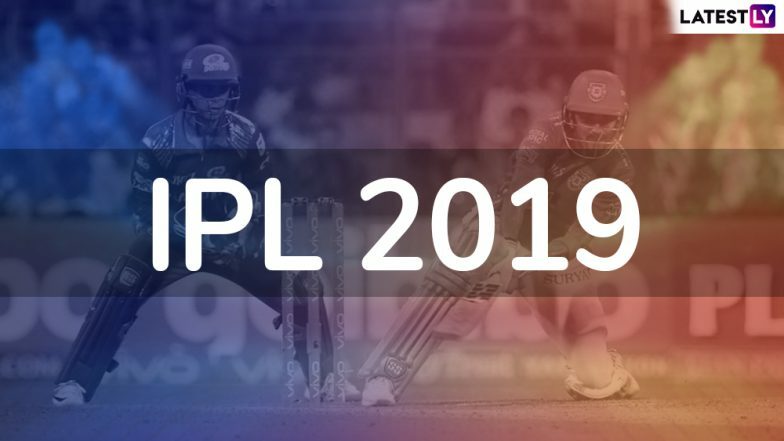 You can download VIVO IPL 2019 Schedule Time Table in PDF Format for Free here. BCCI had to make sure that there is no match in the city going to polls in April-May. The latest schedule released by BCCI is till May 05 and teams will continue to face each other in home and away format. IPL 2019 Schedule Till May 5 Out: Full Time Table of Vivo Indian Premier League 12 League Stage Fixtures, Dates, Venue Details and Match Timings Announced. In the opening match of IPL 2019, defending champions Chennai Super Kings (CSK) will face Royal Challengers Bangalore (RCB). This season there will be no rest day between the league stage matches and all the games will be held back to back. Just ike previous seasons, there will be double-headers on the weekends and on week days only one match will take place. VIVO IPL 2019 Will Be Crucial for ICC World Cup Selection: BCCI. Mumbai Indians v Kolkata Knight Riders (Wankhede Stadium, Mumbai). MS Dhoni-led Chennai Super Kings are the defending champions. The Chennai-based team last season after returning from two-year suspension defeated Sunrisers Hyderabad (SRH) in the final to clinch their third title. CSK will be eyeing to become the first team to win the title four times. Mumbai Indians have also won IPL thrice while Kolkata Knight Riders twice.